This is a map of the United States showing locations of operating nuclear power reactors from the Nuclear Regulatory Commission website. In the wake of the nuclear crisis in Japan I thought that it might be interesting to see where these reactors were located. There are 65 plants across the country but each plant can have more than one reactor/triangle. A few things on the map jump out at me. Almost all of the reactors are east of the Mississippi River. A boatload of them are close to water. Some of them seem to be in areas prone to hurricanes and earthquakes. All reactors are in the Continental United States. My home sits between the reactor in Kansas and the one in Missouri. Anything else come to mind when you look at the map? Is a reactor close to your place? One out of every 8 Americans live in California... just wonder where they are getting all of their power from? @Ed - Must be all of that warm California Sun reflecting off those tanned bodies. Seriously, this map indicates that California power plants are mainly fueled by oil, gas and some kind of hydro-electric sources. We're pretty close to a nuclear power plant. Close enough that the schools all heve evacutation procedures in place. My wife teaches at a school just down the road from the plant. That's a bit disconcerting, to say the least. 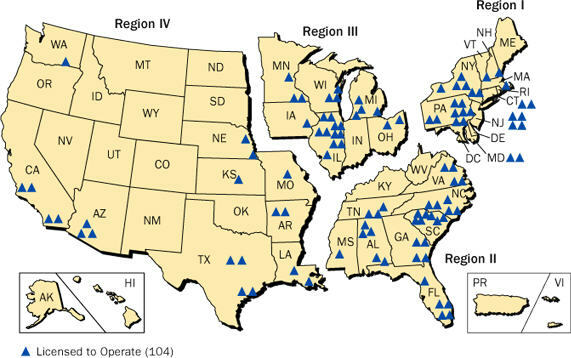 I was blissfully unaware that there are 9 nuclear reactors within a couple hundred miles of me. It looks like at least two or three of them are 50 or so miles away. Looks like my state (PA) has the most triangles of any state other than Illinois. Geez.